Can you hear the crowd shouting ‘Jennifer’? Actress Jennifer Lawrence tripped over a cone on the Red Carpet right in front of Jenifer Mok’s white Rolls Royce limousine! On March 2nd, 2014, South Korean Hollywood Fashion Designer Jenifer Mok, with one "n" in her first name, attended the 86th Oscar Academy Awards with Hollywood Actress Sharon Farrell, who was wearing Jenifer Mok’s “Frozen” themed dress. 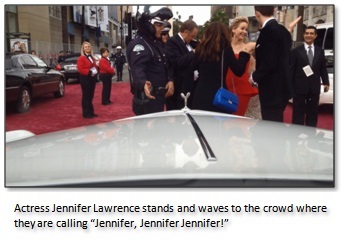 When they arrived on the Red Carpet, they saw Jennifer Lawrence pass by and trip right in front of her limousine!